Norddeutscher Lloyd was formed in 1857 and amalgamated into Hapag-Lloyd A.G. in 1970. According to Bonsor the original flag was a white pennant with a border in the hoist of 12 red and white squares and on the field the black legend "N.D.Lloyd" being used until 1866 or possibly until c.1871-3. Reed 1891 shows a blue flag with the crossed anchor and key emblem between the letters "NDLB" all in white [see below]. The uncertainty of the dates is stressed by Loughran giving 1870 as the probable adoption of the white version shown here which shows the key of Bremen with an anchor representing the sea and a wreath of oak leaves as the traditional symbol of German power. Brown 1958 shows a swallowtailed version which appears to be in error. The fleet commodore, unlike most companies which used a derivation from the houseflag, comprised a white swallowtail with a black Iron Cross [see below] being based on the appropriate German naval flag defaced by a white ball at the centre bearing the company emblem in blue. It's Norddeutscher Lloyd, Bremen, founded 1857, named after the coffeehouse of Mr. Edward Lloyd by Hermann Heinrich Meier. Flag: white, an anchor and key in saltire with an wreath of oak-leaves, all blue. Depending of sources the oak-wreath is blue contoured or all blue. From Wolter's "See und Seefahrt", 1968. I sailed with that company from 1955-59 as a decksboy, youngman, O.S. and A.B. - and I still have a large flag as a souvenir of one of the ships it flew on! The flag remained in use not only until the 1970 merger of North German Lloyd with Hamburg-America Line but for 16 years longer, as the houseflag of Hapag-Lloyd. (A compromise: from 1970 onwards all ships of the combined firm flew the NGL flag and showed the Hapag funnels markings.) In 1986, all ships were given "cognac yellow" stacks and a stylized HL new house flag. See also: "Norddeutscher Lloyd Bremen" by Edwin Drechsel, published 1995. I've regiffed the flag after image on this website. The first depiction of this flag that I know of is a b/w drawing in [stl97], p.85. This differs in minor details (style) from your image. 'Flaggen auf dem Rhein' (1952 ed.) however shows a variant, appararently for inland navigation use. Surprisingly, this house flag features the difficult-to-see combination of black on blue. Otherwise, the design is the same. This image indeed shows the combined anchor, key, and laurel wreath. Caption: 'Norddeutscher Lloyd Frachtkontor (i.e. freighting office, jm) Düsseldorf GmbH', seat: Düsseldorf. Regarding this flag: see end of this page (in German) showing the flag of Commodore Leopold Ziegenbein: there seems to be no difference in colour between the cross and the central emblem (i.e. : all blue). This particular flag was awarded in 1933. It was only awarded once, according to this source. Here is an image from this webpage. (flag order on Comm. Ziegenbein’s gravestone) here. This flag was only awarded once, according to this source. In the beginning the company used a swallow tail pennant. 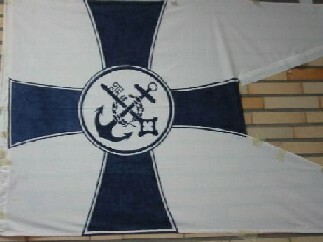 The well known white flag with key and anchor was used since the beginning of the 1870's. Until 1884 all ships had black funnels. Those were replaced by light orange ones (denoted as yellow) at first for the "fast steam ships" and later for all steamships. Later there also existed a light orange funnel with a black top. HAPAG, which later merged with the company used yellow funnels since 1889 for "fast steamships", since 1900 also for all passenger ships with cabins and since 1909 for all ships of the company. The Atlas line used black funnels with a white over red ring from 1901 to 1909. After HAPAG and ND Lloyd had merged the new company used flag and funnel of Norddeutscher Lloyd until 1972. In 1972 the new blue logo was established on orange funnels but until 1987 the flag of Norddeutscher Lloyd was still used. In 1987 the white HAPAG-Lloyd flag was established.. This information was reconfirmed by Harbour-captain Michael Eick on 2 April 2007 in Neumühlen tugboat-base/Hamburg. Description of pennant. The company was located in Bremen. Therefore the pennant had the typical vertical chequered double line at the hoist, here consisting of twelve red and white squares starting with a red one at the upper hoist. The rest of the flag was white with a red stripe at top- and bottom edge. The stripes had the same width as the squares. In the white field was a black inscription "N D Lloyd".